The U.S. Army Corps of Engineers (USACE) implemented management actions for Caspian terns (Hydroprogne caspia) nesting in the Columbia River estuary beginning in 2008, management that was described in the January 2005 Final Environmental Impact Statement (FEIS) and November 2006 Records of Decision (RODs) for Caspian Tern Management to Reduce Predation of Juvenile Salmonids in the Columbia River Estuary (USFWS 2005, 2006). This management plan, which was developed jointly by the USACE, the U.S. Fish and Wildlife Service, and NOAA Fisheries, seeks to redistribute a portion of the Caspian tern colony on East Sand Island in the Columbia River estuary to alternative colony sites in interior Oregon and the San Francisco Bay area by 2015. The goal of the plan is to reduce Caspian tern predation on out-migrating juvenile salmonids (Oncorhynchus spp.) in the Columbia River estuary, and thereby enhance recovery of salmonid stocks from throughout the Columbia River basin. Thirteen of 20 evolutionarily significant units (ESUs) of Columbia Basin salmonids are currently listed as either threatened or endangered under the U.S. Endangered Species Act (ESA). As part of this management plan the USACE completed construction of two 1-acre islands and two 0.5-acre islands at sites in interior Oregon. These specially-designed tern islands included a 1-acre island on Fern Ridge Reservoir near Eugene, Oregon (completed February 2008), a 1-acre island on Crump Lake in the Warner Valley, northeast of Lakeview, Oregon (completed March 2008), and two 0.5-acre islands at Summer Lake Wildlife Area in south-central Oregon near the town of Summer Lake (completed March 2009). 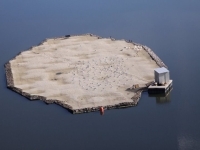 Following the construction of these islands and before the arrival of Caspian terns from their wintering grounds, Caspian tern decoys and acoustic playback systems that broadcast Caspian tern calls were deployed on all the islands to attract nesting Caspian terns. Field crews monitored the islands on Crump Lake and in Summer Lake Wildlife Area throughout the nesting season because there was a prior history of Caspian terns nesting there. In 2009, Caspian terns quickly colonized the tern island on Crump Lake and both tern islands in Summer Lake Wildlife Area, where approximately 670 and 15 breeding pairs nested, respectively. Nesting terns at both locations were successful in rearing young to fledging; an average of 0.17 and 0.80 young were raised per breeding pair at Crump Lake and Summer Lake Wildlife Area, respectively. Prior to island construction in 2008 and 2009, the main factor limiting colony size and nesting success of Caspian terns at Crump and Summer lakes was fluctuating water levels that either inundated the available nesting habitat or land-bridged nesting islands to the mainland, allowing access by mammalian nest predators. In 2009, nest predation by gulls and food availability near the tern islands were apparently the most significant factors limiting tern colony size and nesting success. The diet composition of Caspian terns nesting on Crump Lake and in Summer Lake Wildlife Area consisted primarily of tui chub (Gala bicolor; 75.6% and 82.7% of the identifiable prey items, respectively). In 2009, one sucker (0.02% of identifiable prey items) was observed by researchers at the Crump Lake tern colony during the nesting season, but this juvenile sucker could not be positively identified as either an ESA-listed sucker (i.e., Warner sucker [Catostomus warnerensis]) or an unlisted sucker (i.e., Sacramento sucker [C. occidentalis]). A total of 46 rainbow trout (Salmo gairdneri; 13.1% of identifiable prey items) were observed at the Summer Lake tern colonies in 2009; these trout were likely hatchery-raised and released in nearby reservoirs and streams. 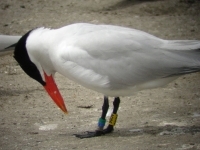 A total of 63 Caspian terns that were previously banded were re-sighted at the tern islands on Crump Lake and in Summer Lake Wildlife Area during the 2009 nesting season. Of these, 24 had been banded at East Sand Island in the Columbia River estuary, over 500 km to the northwest. Based on the number of terns banded on East Sand Island relative to the size of that colony, we estimate that the majority of the Caspian terns that colonized the tern islands at Crump and Summer lakes had originated from the East Sand Island colony. These band re-sightings demonstrate that Caspian terns can be recruited to new colony sites from existing breeding colonies over considerable distances. Because there has been no prior history of Caspian terns nesting at Fern Ridge Reservoir or elsewhere in the Willamette Valley of Oregon, video cameras were used instead of direct observation by a field crew as the primary means to monitor the Fern Ridge tern island. Review of video footage and periodic site visits indicated that Caspian terns did not attempt to nest on the island in 2009, but did visit the island late in the breeding season and during the post-breeding season. Caspian terns were regularly observed on the Fern Ridge tern island from late June to late August (on 31 of 33 days when video footage was recorded), and as many as eight Caspian terns were observed on the island in amongst the tern decoys at one time. Video footage also revealed frequent visits to the Fern Ridge tern island by avian predators of Caspian terns (i.e., bald eagles, great horned owls, and peregrine falcons), and one instance of predation by an adult bald eagle on two hatch-year Caspian terns that were roosting on the island. Based on our review of video footage recorded at the Fern Ridge tern island, avian predators and possibly human disturbance may have precluded Caspian terns from nesting on the Fern Ridge tern island in 2009. Although no management action was undertaken to enhance Caspian tern nesting habitat in the San Francisco Bay area prior to the 2009 nesting season, we monitored existing Caspian tern colonies in the Bay area to gain a better understanding of current colony status, diet composition, and factors limiting both colony size and nesting success in preparation for potential colony expansion at Brooks Island in the Central Bay and island construction/restoration in the South Bay. There were six known breeding colonies of Caspian terns in the San Francisco Bay area during 2009, where a total of approximately 830 breeding pairs nested. This represents a 40% decline in the number of Caspian terns nesting in the Bay Area in 2009 relative to 2004, when the number of breeding pairs in the Bay Area peaked. This decline was largely driven by the decline in size of the breeding colony at Brooks Island, the largest Caspian tern colony in the Bay Area, where colony size was estimated at 681 breeding pairs in 2009, compared to 1,040 breeding pairs in 2004. Nesting success at tern colonies in the Bay Area declined 69% from 2003 to 2009, which again was driven by the decline in nesting success at the Brooks Island colony (0.62 and 0.14 fledglings produced per breeding pair in 2003 and 2009, respectively, a 77% decline). Factors affecting colony size and nesting success were related to attributes of those colony sites as they influenced (a) quality of nesting substrate, (b) susceptibility to mammalian and avian nest predators, (c) displacement by other colonial waterbirds, and (d) human disturbance. 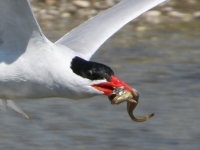 Marine forage fishes, including silversides (Atheridae), surfperches (Embiotocidae), anchovies (Engraulidae), were the predominant component of Caspian tern diets at colonies in the San Francisco Bay area. Diet composition varied among colonies within the Bay Area, however, suggesting that fish assemblages near colony sites differed and nesting terns tended to forage near their nesting colony. In 2009, juvenile salmonids comprised 7.1% of prey items for terns nesting at Brooks Island in the Central Bay, and 0.1 - 0.2% of the diet of terns nesting at Eden Landing and Stevens Creek in the South Bay. A radio telemetry study of Caspian terns raising young at the Brooks Island colony, combined with recoveries of coded wire tags from smolts on the colony, revealed that the vast majority of salmonid smolts consumed by Brooks Island Caspian terns in 2009 were hatchery-reared, non-listed fall-run Chinook salmon smolts that had been released from net pens in eastern San Pablo Bay. Results indicate that the implementation of proposed tern management initiatives in the Central and South San Francisco Bay will not jeopardize ESA-listed salmonid stocks and will help restore the breeding population of Caspian terns in the region. Restoration of Caspian tern colonies in southern San Francisco Bay is very unlikely to have any appreciable impact on survival of juvenile salmonids, either from ESA-listed or unlisted stocks. The preliminary conclusions from this study of Caspian terns nesting in interior Oregon and the San Francisco Bay area during 2009 are (1) Caspian terns can be recruited to new colony sites (i.e., islands in Crump Lake and Summer Lake Wildlife Area) from existing breeding colonies (i.e., East Sand Island) over considerable distances; (2) Caspian terns are more easily recruited to nest at sites with a prior history of tern nesting, as compared to sites with no history of tern nesting (i.e., Fern Ridge Reservoir); (3) the diet of Caspian terns nesting at alternative colony sites identified in the FEIS (i.e., Brooks Island, Crump Lake, and Summer Lake Wildlife Area) consisted mostly of forage fishes that are neither listed under the U.S. Endangered Species Act nor of significant economic value for commercial, recreational, or subsistence fisheries; (4) availability of suitable sites for breeding colonies was the main factor limiting the number and size of tern colonies in both the San Francisco Bay area and interior Oregon; (5) nesting success at existing colonies was limited by attributes of those colony sites as they influenced (a) quality of nesting substrate, (b) susceptibility to mammalian and avian nest predators, (c) displacement by other colonial waterbirds, and (d) human disturbance.